On Easter weekend 2012, fifteen-year-old Sam Berg was spending his Saturday the same way other junior hopefuls across the province were: hunched in front of his computer, obsessively clicking refresh as the Ontario Hockey League draft unfolded with infuriating slowness. Berg was a power forward, a gritty winger who wasn’t afraid to fight older and bigger kids, and who prided himself on playing hard in the corners. That Easter, though, he watched round after round go by without seeing his name. When the wait became unbearable, he left his computer to join his family for dinner. That’s when he got the call from Marty Williamson, the general manager and head coach of the Niagara IceDogs, a team just down the highway that drew sellout crowds. Williamson announced that Berg had been drafted in the fourteenth round—a late pick, but a pick nonetheless. “I just jumped off the wall,” says Berg, who was excited by the chance to add his own story to his family’s on-ice achievements. The excitement didn’t last. A few years later, Berg is leading a $190 million lawsuit against the league that drafted him. The teen, who spent his youth dreaming of a professional hockey career, is today regarded as one of the game’s greatest threats—reviled by owners, GMs, and fans as a turncoat out to destroy an important part of Canadian culture. On any given winter night, from Rimouski to Medicine Hat, thousands file into arenas to watch future stars of the game take slapshots and drop saucer passes, cheering themselves hoarse with every goal and rising to their feet at the slightest suggestion of a fight. If you believe the cliché that hockey in Canada is a religion, then junior hockey—played by apple-cheeked teens far from the corrupting influence of big-league money—is the sport in its purest, most sacred form. The Canadian Hockey League runs the show. The organization oversees the sixty teams and 1,500-odd players in the Ontario Hockey League, the Western Hockey League, and the Quebec Major Junior Hockey League. Players range from sixteen to twenty, and in exchange for competing in towns across the continent, they all get room and board and free gear, and most receive a weekly honorarium of $60. Players and their families are also promised scholarships. But the most valuable payoff is the chance at cracking the pros. The CHL—the place where Wayne Gretzky dazzled as a skinny sixteen-year-old and where Connor McDavid dominated last year—is the National Hockey League’s largest supplier of talent. 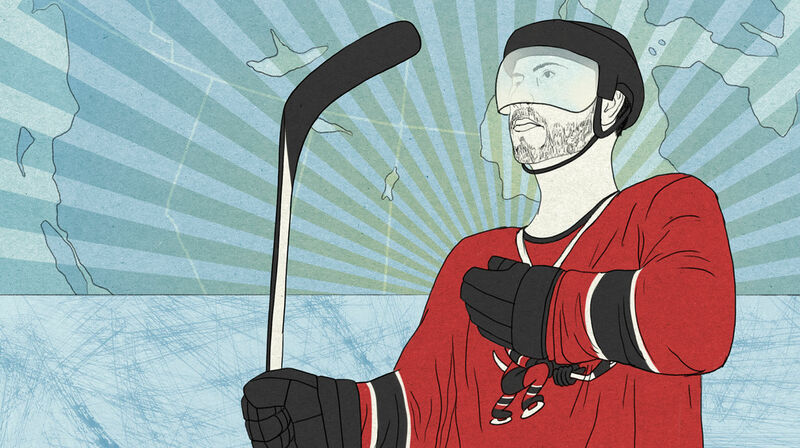 Unfortunately, for many, the NHL will remain a distant fantasy. Odds are, just one or two players from any team will make a living playing hockey. Sam Berg wasn’t one of them. He lasted just eight regular-season games with the IceDogs before he was sent down a level and then traded to the Thorold Blackhawks. There, he reinjured a shoulder. “I hit a guy, and my shoulder popped out, and I couldn’t pop it back in,” Berg remembers. He left the team. His hockey career was over. A few months later, Berg enrolled at McMaster University, in Hamilton, determined to get on with his life. Before signing with the IceDogs, Berg and his family had negotiated a contract giving him a four-year scholarship the moment he laced up for the team (a relatively common arrangement when teams are eager to convince draft picks to sign). According to the IceDogs, however, Berg hadn’t reported to camp after his injury, rendering his scholarship void. They would give him one year; then he’d be on his own. Berg and his parents were outraged. The contract, they assumed, was irrevocable. Berg felt he was being treated like a “racing greyhound”—kicked to the side the minute he was no longer useful. The story then took a disturbing turn. Berg learned that the contract he signed had never been officially approved by the OHL. And because it had never been approved, the OHL now argued that the league wasn’t bound by its terms. But absent an agreement, Berg should never have been allowed to play for the IceDogs. The league’s deceit shocked him. When the OHL began to ignore the Bergs’ phone calls, mutual friends introduced the family to Ted Charney, a class-action lawyer. Charney works out of an office in downtown Toronto, where he specializes in lawsuits against condominium developers. “I know a solid case when I see one,” he says. Berg was focused on his scholarship, but Charney convinced him a bigger issue was at stake. While junior hockey is many things—a place where young players learn a skill, a hub for communities, a piece of Canadian identity—it’s also an economic anomaly, a for-profit industry built on the unpaid labour of teens. In general, players have little say over where they play. They spend between thirty-five and forty hours a week training, skating, taking long bus rides to games. They’re also expected to glad-hand season-ticket holders and local businesses to promote the team. In October 2014, Berg agreed to become the representative plaintiff in a class-action lawsuit against all three major junior hockey leagues. The lawsuit covers thousands of former players who will be automatically included if the suit is certified, with Berg as the face of the class. In Charney’s opinion, the case is simple: hockey players deserve minimum wage, holiday pay, and every other right given to Canadian workers. They are, in a word, employees. The CHL disagrees. President David Branch—who declined to speak for this article—has long argued that major junior players aren’t employees but “amateur student athletes.” The term has a long history in the US, where “student athlete” football and basketball players earn hundreds of millions of dollars for their schools without taking home a cent. But US players are in fact enrolled in academic institutions. In the context of Canadian junior hockey, the label “amateur student athlete” becomes nearly meaningless. CHL teams are not affiliated with schools. Some players finish high school part-time, but many older players aren’t in school at all. Worse, onerous restrictions have kept former players from using their scholarships. For example, because OHL teams require kids to redeem their scholarship within eighteen months of the end of their junior career, players who spend a year playing overseas or trying to make the NHL often lose their chance to go to school. Describing players as “amateur” seems like wishful assertion rather than a reflection of reality. Buy a $28 standing-room ticket to a Peterborough Petes playoff game, for instance, and you’ll find yourself among people wearing $120 jerseys and $30 hats, watching a “Pizza Pizza Powerplay” followed by a “penalty kill brought to you by Conpute.” Between periods, a tiny blimp trailing a banner for the Brick furniture store woozily circles the rink while a Zamboni plastered in ads for Jack Link’s beef jerky resurfaces the ice. The atmosphere mirrors the professional experience in nearly every possible way. There are coaches, general managers, referees, and ushers. Teens sell beer and pizza. The only ones who aren’t paid? The players. “When you compare the money these teams make with what it would cost to pay players minimum wage, it’s really a joke,” says Charney, whose lawsuit claims that junior players help generate hundreds of millions of dollars in revenues annually. Branch has publicly insisted that the CHL isn’t as profitable as people think: about a third of the teams are in the black, a third break even, and a third lose money. Since most clubs are private companies, they don’t have to disclose their earnings. But the business model is hardly failing. The CHL gets 35 percent of the revenue from the World Junior championships, which are consistently TSN’s most highly rated broadcasts. They earn money on sponsorship, merchandise, and other TV rights. Yes, business is cyclical, with crowds largely dependent on the quality of the team, but this hasn’t kept owners from recognizing the value of a club. Last year, The Hockey News reported that the Quebec Remparts, one of the country’s most-prized franchises, had been sold to Quebecor for between $20 million and $25 million. The value of these franchises, argues Berg, comes from teens—teens who appear in video games and put fans in seats, whose names are emblazoned on the back of pricey jerseys and whose play inspires love or despair. The game is a business, and players are the product. On a hot Monday afternoon this summer, Sam Berg sat in the Beamsville arena. The ice was thawed, with kids practising tricks on their BMX bikes in the dusty parking lot. Now nineteen, Berg wore sneakers, jean shorts, and a polo shirt—a young adult with a square jaw and a scar on his cheek, a memento from the time a skate caught him in the face. Having transferred from McMaster to Brock University, in Saint Catharines, to major in labour studies, he’d been reading James W. Rinehart, the author of The Tyranny of Work, and was thinking in new ways about the world around him. The teenage jock was sounding like a campus Marxist. “Labour in sports is not a separate issue from labour in general,” he said earnestly. The lawsuit is moving forward slowly, with certification hearings in Ontario and Alberta next summer. In the meantime, Berg is facing a league determined to prove the case will damage major junior hockey. Paying players minimum wage, the CHL has warned, could result in the closure of dozens of teams in small communities with low attendance. Charney argues that if necessary, as in the NHL, junior teams should expand profit-sharing so that money-making clubs in London and Kitchener can help keep hockey in places such as Lethbridge and Owen Sound. Indeed, the Code has been part of hockey culture since its birth. In the early twentieth century, the leaders of the sport blacklisted any players suspected of taking payment for their skills. It’s a battle that Stephen Harper describes in his hockey history, A Great Game. “Without money,” he writes, “sport was regarded as a noble calling in which the young man nurtured heroic qualities—endurance, courage, self-sacrifice for the team.” The book presents the switch to professionalism as inevitable, but the conclusion includes an elegiac account of what was lost when the game became dominated by “millionaire players motivated more by personal greed than by any devotion to the national game.” The one place the ideal of amateurism still exists, at least in theory, is junior hockey. Today, when Berg talks about hockey, he makes it sound like a toxic relationship, something that requires conscious effort to stay away from. He stopped following junior hockey last year and barely paid attention to the Stanley Cup playoffs. This fall, before his second year of university, he cleared out his room. “I packed up all my trophies from hockey. I didn’t need that constant reminder,” he says.